Custom Dental Office Sign - - 16" x 16" professional office signage holds five lines of custom text. Plenty of room to advertise your dental procedures, display a complex address, or provide information you want patients and prospective patients to notice. Made in USA. 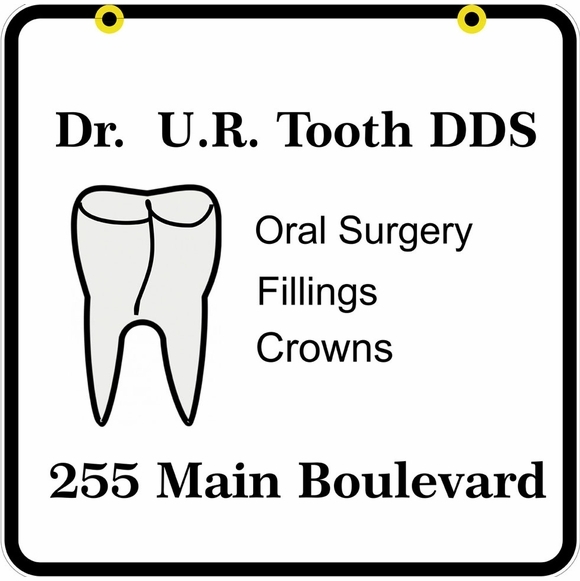 Five-line double-sided hanging address sign for dentists. Same personalization on both sides. Line 1 holds up to eighteen (18) 1" high characters or ten (10) 2" characters. Line 2 holds up to fourteen (14) 1" characters. Line 3 holds up to fourteen (14) 1" characters. Line 4 holds up to fourteen (14) 1" characters. Line 5 holds up to eighteen (18) 1" high characters or ten (10) 2" characters. Tooth image is standard on both sides.